The city of Pittsburgh has already hosted one major multi-day metal music festival this year. Would you believe there’s going to be another one? Or that it’s happening this weekend?? Well… believe it. Featuring a packed line-up spread across two dueling stages at Cattivo in Lawrenceville, Descendants of Crom brings you two full days of doom and sludge and more! Weekend pass $130; single-day tickets $30-60 each; tent or cabin camping available for an additional charge. 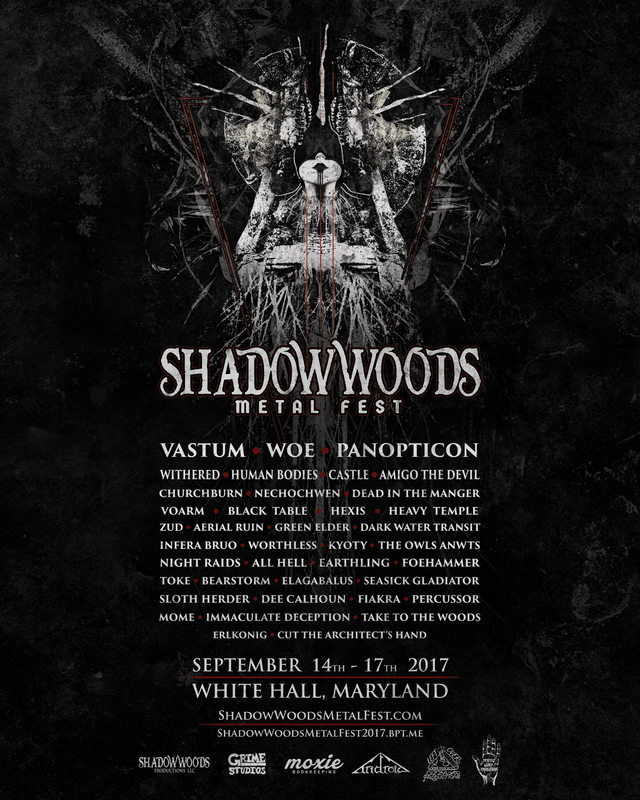 Shadow Woods Metal Fest, the Mid-Atlantic’s only open-air camping heavy metal gathering, is back for a FOURTH year, featuring “over 40 of the underground’s leading bands, representing many genres and subgenres of heavy metal, folk, rock, experimental, and noise” on three alternating stages with no overlap. After the fate of the festival was up in the air for a while following the sale of the summer camp that has been its home for the past few years, and (apparently) some issues ironing out details with a new venue, the folks at Shadow Woods are pleased to announce they will be returning once again to Camp Hidden Valley. Full line-up for the three-day fest can be found below. I’m putting the finishing touches on writing this article during breaks between watching Philadelphia’s hockey team getting demolished during the first game of this year’s Stanley Cup playoffs. Entirely by coincidence, that city (a place whose biggest claim to fame is striking a beloved holiday character with snowballs) happens to be the home base of psychedelic ensemble Ruby the Hatchet. But I’ll implore you not to hold that against them. As you may recall, we wrote about this band’s 2012 debut album Ouroboros when it was reissued back in 2016, and then last summer we mentioned that they would have a new album out soon. Today we’re discussing that album, as RtH prepare to head out on a whirlwind tour of the country over the next few weeks (kicking off this Friday, 13 April 2018). Check out the full list of dates at the bottom of this page. This weekend-long party in Sin City will feature some folks that you’ll recognize from previous mentions right here at Valley of Steel (Neurosis, Conan, Fister, Melvins, Hollow Leg, North, Ruby the Hatchet, Slomatics — just to name a few). Some other highlights will include Inter Arma, Black Anvil, Minsk, Goya, Manilla Road, Mouth of the Architect, Pelican, Vhöl, Year of the Cobra… YOB, Pentagram, Corrosion of Conformity, Sleep, Psychic TV… oh yeah, and King Diamond performing the whole Abigail album! 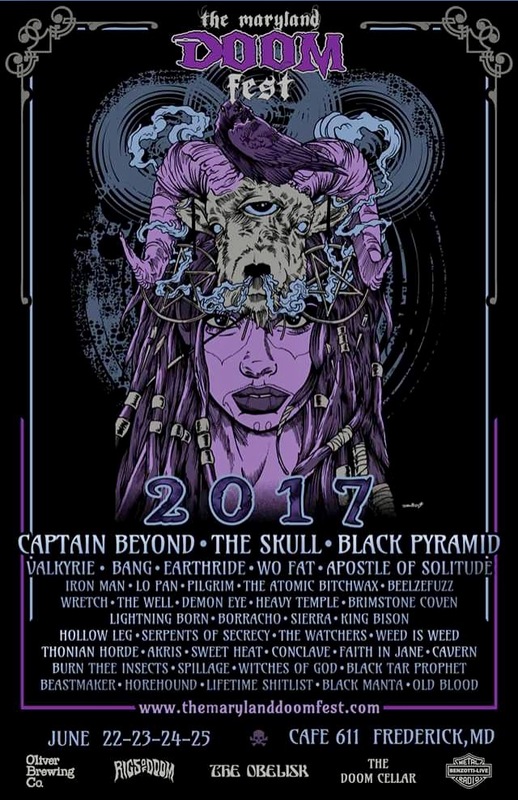 THIS WEEKEND, starting with a pre-fest party Thursday night, will see the return of DOOM to central Maryland — featuring quite a few bands we’ve written about in the past (Pilgrim, Brimstone Coven, Black Tar Prophet, The Atomic Bitchwax, Lifetime Shitlist, Borracho, Apostle of Solitude, and Hollow Leg) along with a few others we’re big fans of (including Cavern and Pittsburgh’s own Horehound), plus TONS more!